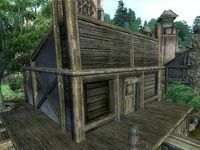 Aleron Loche's House is a home in the middle of Bravil overlooking the Lucky Old Lady and situated above Henantier's House and next to the Skooma Den above Carandial's House. It is the former residence of the too-credulous Aleron Loche, and currently that of his wife, Ursanne Loche. It consists of one zone, Aleron Loche's House. Upon entering the house there is a pair of green felt linens on top of a chest of drawers. A locked clutter chest and a barrel rest on a support wall to the right of the drawers. In the closet near the entrance is a sack of corn and a clutter sack. A wooden shelving unit along the northern wall holds a pumpkin and the locked chest on the same wall houses some armor. On the food preparation bench is a loaf of bread and a wedge of cheese. The east-western corner has two pantries in it as well as a double bed. Aleron and Ursanne carry the key to this location. Although the house is in Aleron's name, he never sets foot in the house. Esta página foi modificada pela última vez à(s) 09h28min de 21 de janeiro de 2015.